Balance Naturals Ultra Ripped Protein is everything Balance Ultra Ripped is. Balance Naturals Ultra Ripped is a natural, high protein, gluten free blend of New Zealand sourced Whey Protein Isolate and Whey Protein Concentrate. 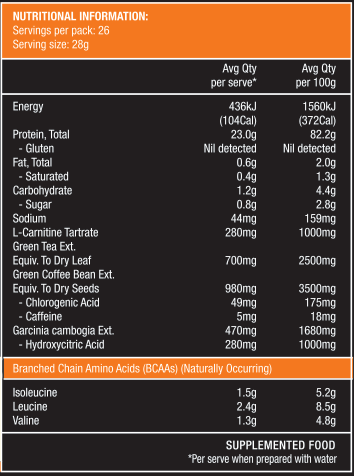 With over 5g of BCAAs per serve and the inclusion of Garcinia Cambogia, L-Carnitine, Green Coffee extract and Green Tea extract, this superior tasting protein blend is scientifically developed to metabolise fat into energy without artificial additives.